This past February, Karina Cisneros, EI, Marie Daboub, PE, and Jingyun Sun, EI. 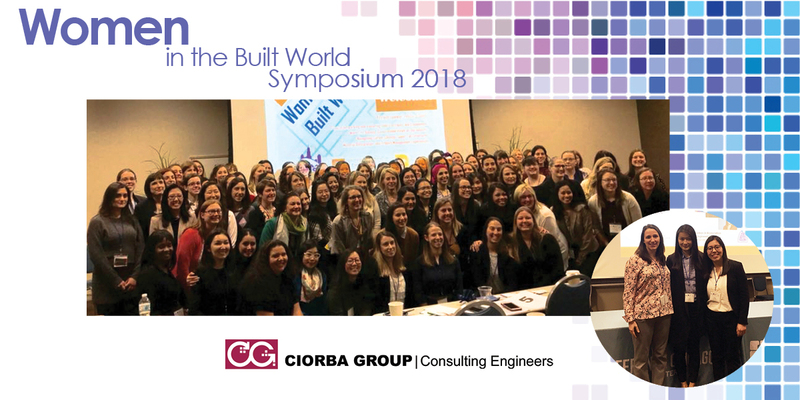 attended the second annual Women in the Built World Symposium presented by SEAOI’s Women in Structural Engineering (WiSE), Women in Restoration Engineering (WiRE) and Chicago Women in Architecture (CWA). The event promotes equity, engagement, work-life balance, and generational views on the Engineering Industry. Ciorba (CG) talked with Karina, Marie and Sun to learn a little bit more about their experience at the symposium. CG: Why is it important for you to attend events like this Symposium.? Karina: Because they make me aware of all the other women who share my struggles and insecurities. Sometimes it feels like I am the only one struggling, but listening to other young professionals, especially young women, makes me feel okay. Additionally, seeing women supporting other women is amazing; it is important to have a support network and seek positivity. Marie: These events provide networking opportunities. I meet very few women on my job, it is nice to hear from other women and how they navigate through a predominantly male field. Sun: I was really inspired by Hi-Sun Choi’s, Senior Principal, Thornton Tomasetti,story. There is no doubt that she is very successful at her job as a structural engineer, at the same time she is also lecturing at several universities. The most important thing is that she is a mom. Her story shows me that, as a woman, it is possible to succeed as mothers as well as professional. Also, the best way to work in a male-dominated industry is to establish yourself as someone qualified to get the job done and be a competent professional. Marie: The keynote speaker Felicia S. Davis, Interim President, Olive-Harvey College was the most inspirational, her presentation focused on career off and on ramps. She discussed ways to encourage women to continue their careers after stepping out for a time to have a child/care for a relative. CG: What are some of the things you learned that could be applied in your work environment? Sun: First of all, “calm down” is the advice that Elizabeth Orther, Principal, Studio 31a, gave us; “:no matter what happens to you, first things first, calm down. Then think clearly how to find a solution to the problem”. Sometimes, when we’re facing problems, we can easily become anxious and the decision we make will most likely be the wrong one. So, we need learn to calm down, even though at times it’s not easy. Second, it’s never too late to a have a mentor. The stories the presenters shared with us made me realize the importance of mentoring and why everyone needs a mentor at work. Karina: I learned that it helps to think nobody expects me or any other to know everything, not to be afraid to ask for feedback, to always ask questions, and to understand my strengths and work on my weaknesses. At Ciorba we encourage our team to go beyond stereotypes and recognize the contributions that each individual, male or female, can make to our company. We believe that when the most talented people can achieve success, regardless of what they look like and where they’re from, as a team we all end up winning. Thanks to Marie, Sun and Karina for participating in these kinds of events, for sharing your thoughts with us and for all the hard work you do to elevate yourself as professionals and for being a valuable part of the Ciorba Team.